On December 3rd and 4th, the Sakyong will perform two pujas, or intensive practices, for the benefit of the community and the world. The Sakyong receives many requests for blessings and overcoming obstacles and pujas held twice a year are times he dedicates to caring for the community in this way. On December 3rd the Sakyong will be practicing Kurukulla, renowned for gathering wealth, beings, and energy to virtuous endeavors, and on December 4th he will practice Vajrakilaya, to remove obstacles. 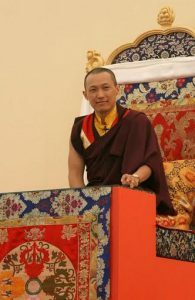 The Sakyong is asking students who have already received Kurukulla and Vajrakilaya to join with him by practicing on those days with the intent of benefiting the entire community. We can request the Sakyong to specifically help a friend, loved one, or us during these pujas. Along with offering the name of the individual being practiced for, which will be read as part of the pujas, it is traditional to make a monetary offering to the teacher. We can include a short description of the situation or endeavor surrounding the request, however the most important connection is the name of the person or endeavor, all of which are kept confidential and burned at the conclusion of the practices. The Sakyong plans to send protection cords to those who have offered names. To include someone in a puja, and for more information, please visit https://sakyonglineage.org/pujas-for-enrichment-and-overcoming-obstacles/ The Sakyong has requested that those who want to participate or connect with the pujas offer red and blue flowers in special places at their home or center on the days of the practice. Those who are doing Kurukulla and Vajrakilaya practice and wish to join with the Sakyong could accumulate 1,000 or more recitations of the deities’ mantras on the days of the pujas and perform feasts at Shambhala Centres wherever possible.